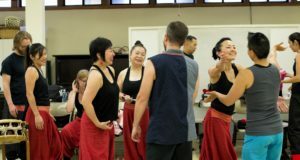 Portland Taiko is pleased to present TAIKO TOGETHER featuring four Portland-based taiko groups together on one stage! 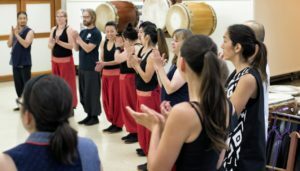 Portland Taiko, Takohachi, En Taiko, and Unit Souzou will join together on Saturday, September 30 at PCC Sylvania, The Performing Arts Center for a rousing evening of group performances, special collaborations between the ensembles, and a commissioned finale for all four groups, written by former Portland Taiko performer Kristy Oshiro. Don’t miss this unique opportunity to see and hear our city’s finest taiko groups in one setting! Get your tickets here! Supported by: Alice Sumida, Carlos and Stacie Tokunaga, and the Regional Arts and Culture Council. Photos by Brian Sweeney.